In good news for those looking for a bargain there are now cheaper alternatives to Nespresso capsules that are 100% compatible with Nespresso coffee machines. The Nestle company that owns Nespresso recently lost one of its patents related to the Nespresso coffee system. Despite fighting the issue it now means that other manufacturers can make compatible coffee pods for Nespresso machines. Alternative Nespresso pods are now available in supermarkets such as Tesco and Aldi. The compatible pods are a similar shape and can easily fit in your Nespresso coffee machine. The coffee itself may taste slightly different, being a different blend but whether it tastes better or worse will depend on your personal taste. 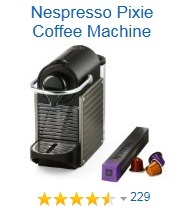 But ultimately it means that that you can enjoy using your Nespresso machine for a slightly cheaper per-cup cost. I tried two of the Aldi versions–Apulia and Ristretto. Not impressed with anything other than the price. I get a nasty aftertaste–maybe because the pods are plastic? Not sure why, and it might be just the way my taste buds work. Anyway, nice price, nice idea, but I won’t be buying them again. The Aldi respresso compatible works well with no problems at all in the Krups Citiz coffee machine and produce excellent tasting coffee. together with the lidl version and the L’or brand the trio of alternatives to the original Nespresso offer everything and are up to 42% cheaper than the Swiss brand. I personally favour the l’or Belgian product being alluminium and certainly a great product but slightly more expensive than the alternative two.Neer the less are almost just as good in certain blends offered…TRY THEM ALL. They all work well in the machines. Alternative Nespresso pods are not always an option. The coffee can be good but some machines, as a result of the copy pod, are not able to dispense properly and are at best, slow, at worst stop the machine prematurely!